Impression: I sincerely love this book. I’ve read it several times over the years, and each time I pick it up I find myself charmed again and not at all let down in retrospect. The prose is lyrical & evocative and easy to read, and the pacing rarely feels weighed down. Most of all, the characters (particularly Alec, Richard, and the Duchess) are very… unique. They’re sometimes hard to like, but very, very easy to enjoy. 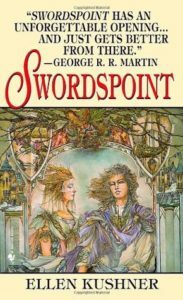 Note: While this is classified as fantasy, Swordspoint is fairly low on the ‘fantasy’ scale (no magic, just stabbing).